Osteopaths use many of the diagnostic procedures used in conventional medical assessment. However, their strengths lie in the unique combination of mechanical, functional and postural assessment. Using hands-on techniques to manipulate and improve the blood, nerve, and lymph supply to a damaged or ill part of the body, the body is helped in its natural ability to self-repair and heal. Osteopaths are primarily concerned with the study of structural and mechanical faults in the body and how these faults affect physiological processes. As structure and function are inseparable and interrelated at all levels, alterations of structure by injury, faulty posture, etc. affect function. Equally function affects structure – poor posture over time affects the neck and back mechanics. Osteopaths have quite a toolbox of approaches. From the very gentle techniques such as ‘cranial-sacral’ work, which may be used when working on very young children, to manipulative approaches when working with joints of the spine that are stuck and misaligned. Remember it’s the correct application of technique that brings about the healing change. HVT or Maniuplation - You can unlock or release a stuck or misaligned joint. Functional Techniques - You can reduce the neural tone, tissue spasticity and muscle spasm allowing joints to move more freely. Low Velocity Stress Techniques – You can move the joint so slowly and gently that the muscles are unable to sense what is happening and as such do not react. Visceral Osteopathy – Gentle manipulation to restore mobility, tone and motion of the internal organs and the surrounding connective tissues. Cranial Osteopathy – Cranial Osteopathy is a very subtle and gentle approach to the treatment of the whole body (not just the head as its name suggests). It simply recognises the importance of the subtle mechanics at work within the head and their profound influence on the health of the whole body. 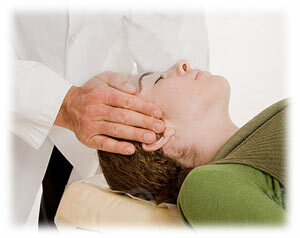 Cranial Osteopath treatments may be used alongside the more conventional osteopath treatments of neuro-muscular techniques, deep soft tissue massage, passive joint stretching, gapping and manipulation. There are some patients who benefit more from a pure cranial or indirect approach. Often find traditional osteopath treatments uncomfortable, may tolerate cranial treatments. Better. Cranial osteopathy is very effective when treating infants and children, pregnant women and post partum mothers.